Our membership cycle is based on the calendar year from January 1 through December 31. 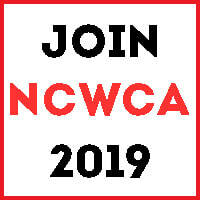 Join NCWCA in October, 2018 and become a member right away for the rest of the year all the way through December 31, 2019. Sign up online, pay your membership with a credit card or Paypal, and upload up to six images on the NCWCA Online Gallery. You can update your profile and images throughout the year. As a member, you'll get on our email list, receive a monthly subscription to News & Notes e-news where you can announce your exhibitions, publications and workshops and find out about meetings, events, workshops, exhibitions and conferences. You also become part of National WCA and enjoy benefits and discounts nationally and internationally as well. 2019 NCWCA MEMBERSHIP WINDOW IS NOW OPEN! Join now and get up to 15 months of membership for the price of 12. Your membership begins right away and lasts through December 31, 2019. Current members renew now and don't miss out on 2019 benefits such as discounted Ghost Ranch artist residency, National WCA Annual Conference in New York City, and many more 2019 offerings. My email and password didn’t work. How do I get into my profile page? Make sure you are using the same email address as the one we used to notify you of your renewal. Check to see if you are using the password correctly. It is case-sensitive. I'm a new member and don't have a member ID. No worries. You do not need a member ID to sign up for NCWCA. When NCWCA notifies National WCA that you've joined us, they assign a member ID number to you. The NCWCA administrator will add your ID to your records after National has assigned it. I don’t have Paypal. Can I use my credit card? Yes. You do not need to set up a Paypal account to pay via credit card. If you do not have a Paypal account, you can pay by using any credit card company listed on the Paypal page. Yes you can, though the manual processing of your application will delay your membership process by up to two months. Complete the application online and select the Pay By Check option and print out your profile. Mail it, along with a check made out to NCWCA to Marguerite Elliot, Membership Chair, 172 Ridgeway Avenue, Fairfax, CA 94930. My profile information is wrong. You can edit your profile by clicking [edit profile] next to your name. My assigned password is hard to remember. You can customize your password by clicking [change password] next to your name. You can get a new password by going to the Membership 2016 page and selecting [Forgot Password]. A new temporary password will be emailed to you. I don’t want to sign up for a committee or an internal caucus. These selections are optional, not mandatory. I don’t have access to a computer/ I don’t use a computer. The administrator can help set up your records on the telephone or by email. She will then mail you a profile confirmation. Please send a check made out to NCWCA for your membership and a copy of your profile to Marguerite Elliot, Membership Chair, 172 Ridgeway Avenue, Fairfax, CA 94930. You pay one lump sum and have a lifetime membership in National WCA, in the NCWCA chapter, or both. Lifetime membership in National WCA costs $750. By choosing to purchase National Lifetime membership, you only pay annual dues of $25 to NCWCA to continue to be a chapter member. Select Lifetime National/Annual Chapter on Memberthingy to purchase lifetime National WCA membership and the annual NCWCA membership. To purchase combined National and Chapter Lifetime membership, log into NCWCA's Memberthingy and select the Lifetime National and Chapter option at $1,000. To purchase a lifetime membership in NCWCA, log into NCWCA's Memberthingy and select the Lifetime Chapter option at $250. Unless you previously selected National Lifetime, you will have to pay annual dues to National WCA. You cannot be a chapter member without national affiliation. You must be both a National AND chapter member. I need to apply for financial hardship. Before you start the online process, please email an explanation of financial hardship to Marguerite Elliot at marguerite.elliot@gmail.com. Your email will be reviewed by the Membership committee and the Treasurer. You will be notified after this review and if approved, you may sign up online and select Hardship - Financial. If you already signed up for financial hardship online, please email an explanation of financial hardship to Marguerite Elliot at marguerite.elliot@gmail.com. Your email will be reviewed by the Membership committee and the Treasurer. You will be notified after this review and if approved, you may sign up online. Note that images you upload to the online gallery will not appear on the NCWCA website until after your hardship has been approved. I need to apply for student hardship. Before you start the online process, please email a copy of your current full-time student ID or bursar’s receipt to Marguerite Elliot at marguerite.elliot@gmail.com Your email will be reviewed by the Membership committee. You will be notified after this review and if approved, you may sign up online. If you already signed up for student hardship online, please email a copy of your current full-time student ID or bursar’s receipt to Marguerite Elliot at marguerite.elliot@gmail.com. Your email will be reviewed by the Membership committee. You will be notified after this review and if approved, you may sign up online. Note that images you upload to the online gallery will not appear on the NCWCA website until after your hardship has been approved. I don’t have any images to upload right now. Or I have fewer than six images. Can I upload later in the year? You may upload images anytime during the year after you’ve paid your membership fees. You may also replace your images anytime during the year. You may upload as few as one image and as many as six images. My images don’t upload or don’t look sharp. Make sure your jpgs are close to the optimal size. The optimal size for each image is 600 pixels WIDE, 72 dpi, RGB color mode. Images larger or smaller than 600 pixels wide may be somewhat distorted or unsharp. Images in the CMYK color mode will not upload. Email us at ncwcachapter[at]gmail.com and put Membership on the subject line.